Hyper Bounce Blast is a unique shooter from Flump Studios, which serves as a follow-up to their well-received Horizon Shift title from a year ago. 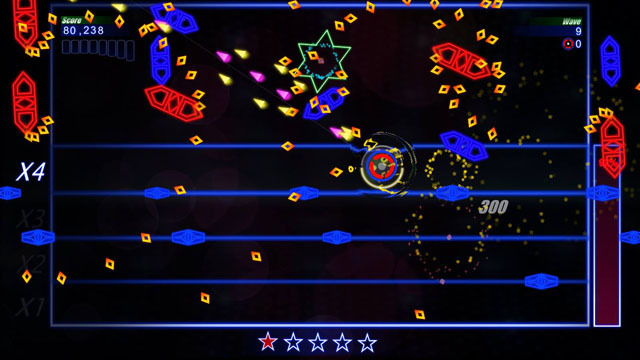 The game mixes twin-stick shooting with elements from starfield shmups like Galaga, bullet hell shooters, and even platforming. Bouncing on certain enemies allows you to become invincible and penetrate bullet curtains to gain points, power up your hyper meter, and put the hurt on enemies and bosses. The game's bonus round also features an homage to Atari's classic Centipede. The game is coming to Steam for PC on May 27.